Sir Gerald Kaufman – the world’s greatest weapon against Anti-Semitism! Sir Gerald Kaufman is the world’s greatest weapon against Anti-Semitism! As people worldwide are driven to despair over the unrelenting cruelty of the Palestinian Occupation it is easy to start blaming all Jews for the suffering of the Palestinian people. After all, the Israeli government claims that it speaks and acts of behalf of all Jews. It would be understandable (though regrettable) if any number of otherwise compassionate and intelligent people bought into this rhetoric, except that people like Sir Gerald expose the lie for what it is! Sir Gerald Kaufman is unmistakably Jewish and proud of it! At the same time he is a passionate advocate for the Palestinian cause and a card-carrying member of the ‘Boycott, Divestment and Sanctions campaign’ (BDS) against the Israeli government. Below is Kaufman’s latest offering, delivered to the British Parliament on February 5th in the context of a debate over human situation in Gaza. May God strengthen Sir Gerald to make many more such stirring speeches, and may God grant Sir Gerald’s colleagues ears to hear them! 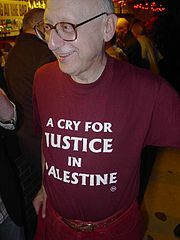 Tags: Gaza, government, israel and palestine, palestine, Palestinian, Sir Gerald, Sir Gerald Kaufman. Filed under Israel and Palestine, israel and palestine conflict by Father Dave on Feb 19th, 2014.